growing evil looms like a shadow over his quest. 01-29-2014 scott Box Text Dawn of the Hunter. Leon Belmont, an eleventh-century nobleman and knight of the clergy, is about to be wed when his fiancee, Sara Trantoul, suddenly disappears. Leon embarks on an epic journey to bring her back, unaware that a growing evil looms like a shadow over his quest. 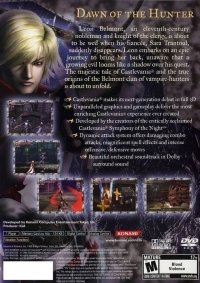 The majestic tale of Castlevania and the true origins of the Belmont clan of vampire-hunters is about to unfold. 09-01-2011 scott Box Text Dawn of the Hunter. Leon Belmont, an eleventh-century nobleman and knight of the clergy, is about to be wed when his fiancee, Sara Trantoul, suddenly disappears. Leon embarks on an epic journey to bring her back, unaware that a growing evil looms like a shadow over his quest. 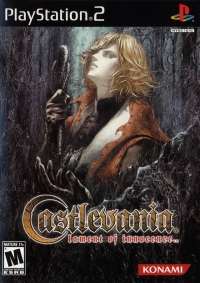 The majestic tale of Castlevania and the true origins of the Belmont clan of vampire-hunters is about to unfold. 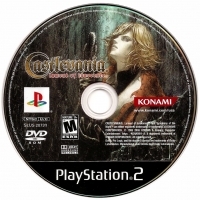 This is a list of VGCollect users who have Castlevania: Lament of Innocence in their Collection. This is a list of VGCollect users who have Castlevania: Lament of Innocence in their Sell List. This is a list of VGCollect users who have Castlevania: Lament of Innocence in their Wish List.